If you’re using twitter you’ve probably already discovered the many ways that the platform can be an asset to your brand or company. Taking the time to squash your marketing messages and opinions into 140 characters can be hugely beneficial. Unfortunately this comes with the odd pitfall. Namely trolls. 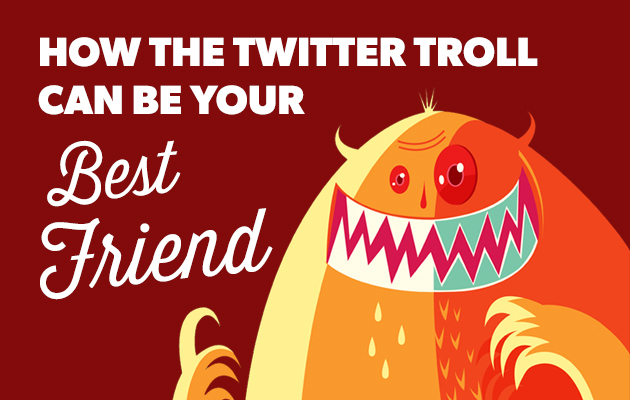 Twitter trolls are largely unavoidable and the bigger your brand the more attention, both good and bad, you’re likely to attract. Don’t worry though, all is not lost and if you’re smart about it you can make being trolled work in your favour. Having someone aim a negative tweet in your direction gives you an opportunity to show how you respond to drama or criticism. Marketing and sales is, at the end of the day, at the most fundamental level, just a person talking to a person. Consumers like to see the real people behind a brand so it really helps if you can bring that to life in a credible way. The need to address, rather than ignore, any twitter engagement has become a bit of an unspoken rule for brands. This rule still applies even when the engagement is negative. Being prepared to tackle issues and, importantly, ensuring you don’t fire back a rash response to a rude or aggressive tweet will pay off ten-fold if you hit the right tone with your reply. Staying professional but using a bit of humour, or humility, or sometimes even just sending back a benign response is enough to let the tweeter know that they were heard, and that’s all it takes. One of the most attractive things a brand can do online is to be seen to participate in current events as they happen. This includes responding to any backlash or trolling. If you can keep a cool head, good manners and a sense of humour when you’re under fire you will benefit from interacting in real time. You’ll be talking to your audience, rather than advertising at them, and be potentially bringing them on board. Be clever about it and you could make the situation work in your favour and create a united response for defence – a kind of tribal sentimentality among your followers – which in turn can turn those followers into enthusiastic and engaged advocates of your brand. All thanks to your new friend, the troll. Follow us on twitter at @unionroom.